This comprehensive temperature monitoring system monitors six temperatures, including two exhausts, using Maretron’s 8” TSM800C touchscreen, a Temperature Monitor (TMP100) and six Maretron temperature transducers. The Ethernet gateway allows you to view the temperatures on a smartphone or tablet so you can observe all data remotely. Finally, the Vessel Data Recorder (VDR100) keeps a complete record of all the temperatures, with the GPS200 providing reference positions and times. In addition, the software in the TSM800C touchscreen can monitor all the temperatures and sound an alarm if any of them goes higher or lower than a preset limit. TSM800C Display 8” Touchscreen displays data in this list, monitors the data and if there is a problem will sound external buzzer. 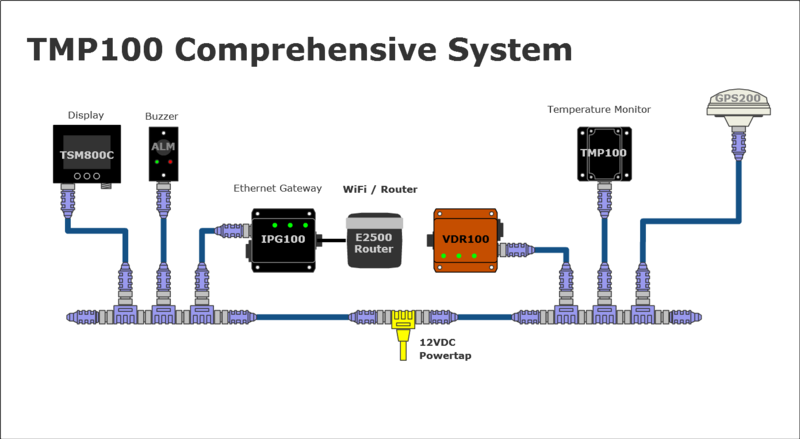 The following components (click to enlarge) are examples of how monitored data can be displayed on the TSM800C, tablet or smartphone using N2KView or N2KView Mobile. The components are arranged on favourite screens at positions and sizes to suit the user's needs. See N2KView web page for exampes of full screenshots.